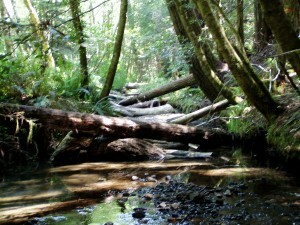 As a board member of the Salmon Restoration Association, this reporter voted several years ago to spend $30,000 from the 2008 World’s Largest Salmon Barbecue for stream restoration on Kass Creek.Our money would go primarily to inserting woody debris in the creek, with the supposed result being recreation of habitat for threatened Coho salmon. 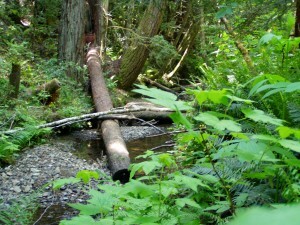 I hoped those who said putting logs into a stream was truly a fishy idea, but I confess I was a little skeptical. My knowledge of the people involved found their credentials first rate and knowledge much greater than my own. As a lifelong news reporter often unimpressed by committees, I was inspired by the actual work done by the coalition of timber companies, environmental agencies, non profits and governments known as the Noyo Watershed Alliance. So I voted to spend the money but decided to watch and listen and hope.The NWA brought in at least another $150,000 in grant funding to replace a low slung bridge with a 60 foot steel structure with better clearance, now allowing salmon to get past the bridge to a restored Kass Creek. The SRA got everything started by pledging the funds for the stream work. My doubts were lifted when I went on a tour of the ongoing work with about 30 other people involved in SRA last fall. We all saw that the World’s Largest Salmon Barbecue funds had spawned more than just salmon habitat, but a process now helping put life back into rivers and streams all over Mendocino county. Campbell Timberland and Cal Fire employees drove us all along the Noyo River just a few miles out of Fort Bragg, passing through dense forests and several locked gates. Seeing the project in action was a dramatic lesson in how different something is in person rather than read on paper. When I was an undergraduate at Humboldt State University, a professor there said to never write a news story about a piece of land until you put your two feet on its dirt. When I did, the story from the government meeting never failed to change dramatically after my boots got muddy. I could step across Kass Creek and walk it to where it met the Upper Noyo River. Along that stretch we all saw an ingenious creation lumbermen and environmental agencies partnered to create. I learned a lot but I also got angry at one point. We were shown the remnants of railroad tracks that old time loggers put down in the middle of the creek. This was an act of streamicide, assault with a very deadly weapon on the fishing industry and fish by the timber industry. When was it done? The 1950s was the best guess. Someone ran a bulldozer up the creek, obliterating everything, unleashing tons of erosion. Then a train track was used as the easiest way out of the forest for logs. Did they close their eyes and simply not think of their grandchildren? Modern lumber companies like Mendocino Redwood Company and Campbell Timberland Management spend a huge amount of their budget battling the mess left by loggers past. After seeing the modern biologists/loggers in action it’s clear they have a plan now to create a sustainable future, where timber can increase in value every year, not become a gigantic liability for other industries, the planet, drinking water and on and on. Dave Wright of Campbell Timberland Management told us how this log scattering business, which had seemed at a bit goofy to me when seen only on paper, has created a minor industry. “A couple of years ago, I was looking for a cost effective way to do these kind of restoration projects. We worked with the Department of Fish and Game to come with this method,” Wright said. He then described how two local entrepreneurs with both lumber and biology backgrounds came up with a method to reuse trees and recreate the salmon-spawning habitat. Their company is getting a lot of work. “This work is now being done this way around there everywhere around here, Big River, Ten Mile, they have dialed it in as they have gone along,” Wright told us. So we saw a process being used all over Mendocino County, but in locations so remote, the restoration will likely never be visible to the community volunteers and ticket buyers at the World’s Largest Salmon Barbecue, who helped make it happen. Salmon, on the other hand, have an uncanny ability to find spawning grounds, even ones unused for generations, studies show. What did we see?For one thing, the big logs are arrayed in a way that causes the stream force to dig deep pools, places where baby salmon can hang out while maturing enough to begin their trip back to sea. 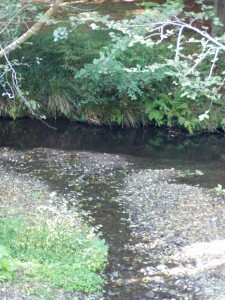 There were already minnows in the pools, some of which were either trout or salmon. Many more were expected after salmon season. Kevin Faucher of Campbell Timberland stood over a log and showed how the positioning of the logs helps create scouring for pools. Perhaps more importantly, the logs are set up in a way to allow the natural water pressure to scour away mud and leave the gravel that adults need to spawn in. The stream project represents major change in the thinking of timber companies and environmental agencies. Ecosystem based management and wholesale restoration requires a flexibility that regulators have often failed to have. Wright explained that the flexibility that came with grants that involve pre-planning among regulatory agencies is perhaps more important than the grant money itself to a company like Campbell. “For us, it’s been easier to do this because the grants come with all the permits. As a timber company, we find the permit process is much more onerous than the grant process…..Getting the permits with the grants is worth more than the money,” Wright said.Part of the process involves keeping alders close to the stream to literally feed the life in the stream, trees that would have once been whacked like weeds for “more productive” species.“The duff leaf litter comes off these trees, the alders and the conifers, this is like high test fuel for the creek,” Wright said.A study by the Regional Water Quality Control Board found that returning streams to their natural state with lots of big logs available can not only help restore salmon but improve water quality.“The availability of large woody debris and deep pools appear to be two of the main factors limiting the success of salmonids in the Noyo River watershed. Coho populations today are probably less than 6 percent of what they were in the 1940’s and there has been at least a 70 percent decline since the 1960’s,’’ the RWQB documents state, citing numerous studies. Steelhead, which are trout which migrate to the ocean like salmon have actually done better as the Coho populations have dropped, but not enough to create any fishery for steelhead. While its true the logging companies clearly are spending a lot to fix the environment, its also clear they are getting tax grant money to pay for repairs that will help them keep logging. The grant funds also allow many agencies to be involved and many more ideas to come to the table to fix costly damage that once enriched the entire. 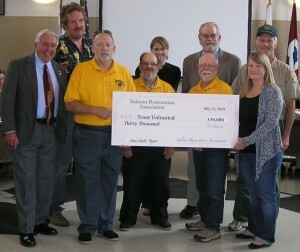 Our $30,000 was actually brought to the table by Trout Unlimited. The RWQB document shows how the abuse of streams and erosion has had big impacts on the water quality in Fort Bragg and created massive costs for the Noyo Harbor Commission and the federal government. The City of Fort Bragg had to build a new water plant in 1987 to deal with the Noyo River’s choking sediment load. The water intake system was designed to frequently back flush compressed air through the intake screens to remove silt that was plugging the screens. Noyo Harbor dredging volumes have increased dramatically over the years as the practices of historic logging have literally sunk in, the RWQB study states. “The average dredging volume in 1994 was 236 percent of the average volume in 1957 and 127 percent of the average volume for the first ten years of dredging (starting in 1933), the RWQB document states. The Noyo River watershed is a 72,323-acre area that starts immediately west of the City of Willits with an average annual rainfall of 40 – 65 inches. Mendocino Redwood Company, Hawthorne Timber Company (managed by Campbell Timberland Management) and the Jackson Demonstration State Forest (run by CalFire) together own70 percent of the watershed. Old growth logging started in the mid 1800’s and continued into the early part of the 20th century. Second growth logging began in the 1960s and continues today. Removal of the last few isolated old-growth stands began in the 1960s and continued into the mid 1980s, the RWQCB study states. The timber and Cal-Fire tour guides from 2010 have offered SRA another tour, to see how its coming along. We are all looking forward to that, and I’ll provide an update when we do.